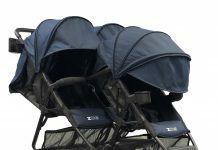 The XL3 is a new triple stroller by ZOE! It is so so cool! As the first of its kind, the XL3 is an optional double or triple stroller. So the front (triple) seat hooks onto the front of the XL2 BEST v2 double stroller by ZOE and has its own set of wheels which provides for tons of stability and perfect turning! We will have so much more info on this stroller as ZOE releases more video, pics, pricing, and specs. The initial sneak peak on Instagram has us believe in that this is going to seal the deal on the XL2 double stroller being the absolute best choice out there and the new XL3 triple stroller as the best triple stroller ever made. No joke! We’re stalking about an optional double/triple stroller that weighs somewhere around 25lbs, can fit through standard doorways, and more. Amazing!! Stay tuned! 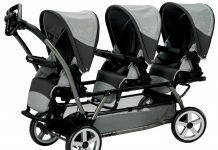 Previous articleTop 10 Best Triple Strollers & Wagons for Triplets 2019! 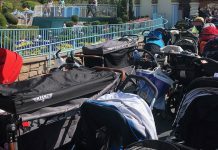 Next articleShould I Buy a Double or Triple Stroller? Hi! How were you able to try out the Zoe XL3 stroller? I am super interested in getting my hands on it!